The triple Goddess symbol identified by it's depiction of 3 moons waxing, full and waning represents the 3 form of the Goddess:the maiden, the mother and the crone, feminine power and the 3 stages of life: birth, life, death. The waxing moon or the maiden aspect of the Goddess represents birth, new beginnings, purity, innocence, youth, excitement, and being care free. The Goddesses most known in this form were Persephone, Brigid and Artemis. The full moon or the mother aspect of the Goddess represents of course motherhood, fertility, stability, female power, and fulfillment. The Goddesses most know in this aspect were Gaia, Demeter, Freya and Isis. The Waning moon or crone aspect of the Goddess represents wisdom, compassion, experience and repose. 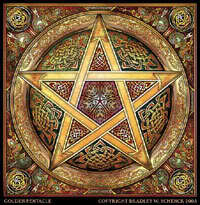 The Goddesses most recognized in this form are Hecate, Morrigan and Hel. This symbol dates back even before judaism and christianity and was even seen as a symbol for psychic abilities and was often and still seen on head dressings of priestesses.